I will tell the story of how I got Lily. It is however very upsetting for me, and I do request that you please try not to refer to it again. I will have a hard enough time just typing this out much less answer any questions about it. I used to work at a small zoo. This zoo had a hand raised PD for educational talks and pets discussions. This guy had been a late baby. A person from Lubbock was doing the PD control for the zoo, and she comes in June or July when the babies should all be big enough to care for themselves. Anyway one litter was found that was really late. They were still really small. 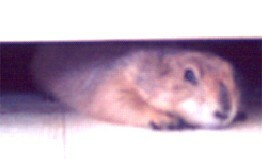 The head zookeeper kept one of them to raise, and the prairie dog control person took the others to care for. When I started there he was almost three years old. 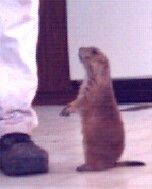 He was well bonded with the head zookeeper, but soon bonded with me also and I would take him for walks. 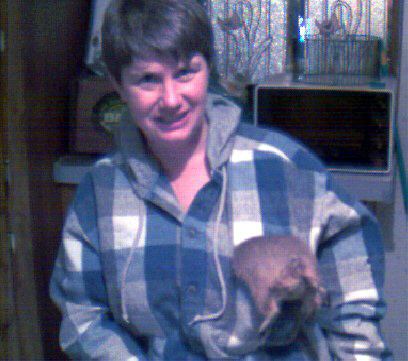 He liked to hide in the sleeve of my jacket. And out to a nice enclosure for him to play in. Anyway After almost a year. During the summer, the zoo had a bunch of summer youth kids helping out. I do not recall the exact day, but it was my day off either a Friday or a Saturday, The kids or someone was playing with him, and did not properly latch his cage, which happened to be inside a building. They also did not check to see that the door to the building was properly closed. So he got out. He managed to get down by the zoo's carousel. People noticed him running around underneath the carousel kind of scared like. The carousel operator stopped the carousel to give him a rest and see what he would do. they thought he was a wild on that just go caught up with the activity. The zoo does not have a complete and absolute confined pen for the regular PD population. They tend to spread out all over the place before the Prairie dog control person gets there to pick up the strays outside the regular pen. Anyway since that carousel stopped spinning, and every one was looking at him, he ran up to a little girl. I guess to see if she would pick him up and take him home. According to the reports from the people that witnessed this he jumped at the girl, then he ran up to a man. People started getting scared of this mad wild PD. At that time, there was only one person at the zoo a grounds keeper with not a single piece of a brain in his head. He says he tried calling the head keeper, and the zoo director, Which means he would have had to go up to the main zoo buildings. He could have done a quick check then to see if by any chance it was our PD running loose, BUT NOOOOOOO he was too STUPID for that. In addition, he also did not try to get the nets or cages to try trapping this critter. Instead his missing brain guided him out the door past the building, out of the park across the street to his buddy's place to get the Pellet gun. Then he came back past the building, still never bothering to check or try alternative methods and back down by the carousel where in front of all those people he shot SEVERAL times this helpless PD who was looking for someone to take him back home. Anyway I have to skip ahead now I'm having a lot of trouble finishing the rest of the story, but basically the prairie dog control person heard of the incident and brought Lily along with her when she came out for her yearly PD pickup. Lily was intended to stay at the zoo as the replacement Educational animal, but the head zookeeper was also very upset and not ready for another so soon, and also wanted to hand raise another herself, So she let me take her to me instead.